This NO-PREP foldable is perfect for students to organize their notes for solving exponential equations. 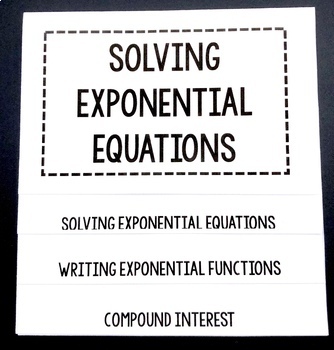 Students will take notes about solving exponential equations, writing exponential functions, and compound interest. 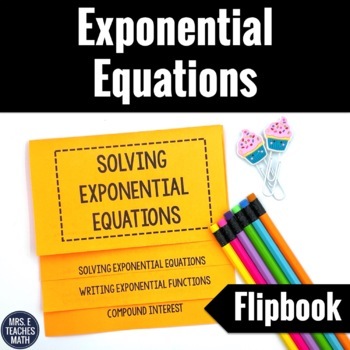 This flipbook contains everything your students need for solving exponential equations. 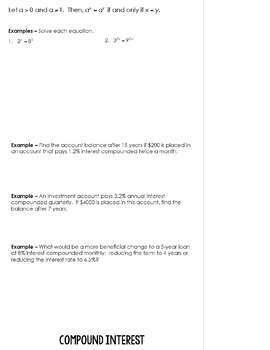 There are three tabs: Solving Exponential Equations (variable in the exponent), Writing Exponential Functions (from two given points), and Compound Interest. Two versions of the flipbook are included. 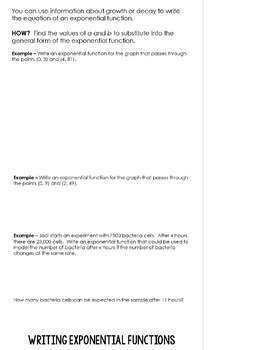 One version has all of the "notes" typed and students only need to fill in the examples. The other version leaves more for students to fill in. This foldable must be copied double-sided. Folding instructions and a complete answer key are included. Make sure this is appropriate for your students. Look at the product preview to make sure this fits within your curriculum. This is also part of my Algebra Foldable Bundle.